Peter Kwasniewski, born in Illinois in 1971, is an outstanding personality of American traditional Catholicism, which is known today as the vigorous and vocations-rich cutting edge of the Catholic renewal. 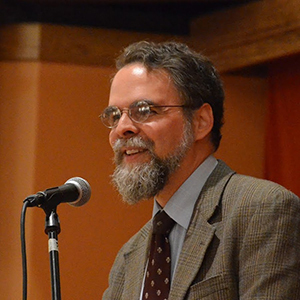 Peter Kwasniewski’s vocation is music, but he also has had an excellent philosophical formation (his doctoral dissertation was on the ecstasy of love in Thomas Aquinas). He was a professor at the International Institute on Marriage and the Family in Austria, which is part of the John Paul II Institute founded by Cardinal Caffarra. He has also taught vocal music, conducted choirs, scholae cantorum, and music workshops. He has composed a significant body of work including Masses (Missa Spiritus Domini, Missa Spe Salvi, Missa Brevis, Misaa Hereditas Mihi, Missa Honorificentia Populi Nostri), motets, hymns, chant, antiphons (Seven Antiphons for the Mandatum) and acclamations. These have been performed by the Vittoria Ensemble, by Cantiones Sacrae, and others. Dr Kwasniewski has published a host of articles on philosophy, liturgy, music—in particular on the restoration and renewal of the sacred in the current Church—as well as a series of remarkable books such as: Tradition and Sanity. Conversations and Dialogues of a Postconciliar Exile (Angelico, 2018); Noble Beauty, Transcendent Holiness: Why the Modern Age Needs the Mass of Ages (Angelico, 2017); Resurgent in the Midst of Crisis: Sacred Liturgy, the Traditional Latin Mass, and Renewal in the Church (Angelico, 2015). We are profoundly grateful to him for accepting this interview with us. Many catholics don’t even want to know the Traditional Liturgy because they consider it to be a thing of the past. Do you think it’s a thing of the past or a thing of the present and maybe of the future? It seems to me that there’s a fundamental problem in thinking about the liturgy as something which is exclusively of the past or of the present or for that matter of the future, because Catholics have always thought about the liturgy as participating in the eternal now of God. That is, in the liturgy we come face-to-face with the mysteries of Jesus Christ who is the eternal High Priest, who is living and active in the church right now, so the liturgy is always in the present moment. But it’s obviously given to us by Our Lord at the Last Supper, it’s the ratification of the New Covenant, it’s His blood on the cross. And so the liturgy is always looking back to the past, and it’s also looking to the future: to the second coming of Christ, the eschaton, the heavenly Jerusalem. So the liturgy is timeless and also bound up with every facet of time. Part of the problem with the postconciliar liturgical revisions is that they tried to bind the liturgy to a particular time, namely the time of modern man and modernity—whatever exactly “modernity” means. Suddenly there came to be an antagonism between the liturgy of the past and the liturgy of the present, and this antagonism is completely foreign to the catholic way of looking at the liturgy. You have written a lot about transcendence in the traditional liturgy. How does this transcendence respond particularly well to the expectations of modern man, so busy with social networking and without enough time to experience silence? If I could use this metaphor: the traditional liturgy is the nutritious food, full of vitamins, that modern man is particularly lacking. You talked about busyness or activism. There’s a definite tendency towards immanentism in modern times. People are plunged into their day-to-day activities and they’re trapped by them, they’re almost imprisoned by the contemporary world. The liturgy is actually a gateway, a doorway, to another realm. A realm which is not imprisoning but freeing and liberating. The traditional liturgy brings an encounter with eternal truth and eternal realities that can save man, modern man in particular, from that trap, from that prison. The other thing that has been pointed out by many is that the very nature of human beings is to be ecstatic: they want to go out of themselves, they want to give themselves to some cause. They want to give themselves in love to another person, they will even give themselves to an ideology. We want to live outside of ourselves, we don’t want to be trapped within ourselves There are a lot of false ecstasies for modern man: obviously abusive drugs is a major example of people trying to escape from themselves, but it’s false, it doesn’t actually succeed, it’s only a temporary illusion of liberation. Ratzinger talks about this in a number of places. Rock concerts, too… There are all sorts of pseudo-liturgical, pseudo-mystical experiences that people are seeking, and what the Catholic Church has always offered is a real mystical experience, a real self-transcendence, a real ecstasy. That’s why the traditional liturgy is more urgent than ever. Paix Liturgique has undertaken several opinion polls around the world which reveal that more than 30% of Catholics that go to Mass every Sunday would like to live their Catholic Faith to the rhythm of the traditional liturgy. Does this surprise you? Do you think it should surprise Diocesan Bishops? The number of 30% surprises me. I think it would be even higher if Catholics were aware of the traditional liturgy. There are many who are still not aware of it and I meet in my travels and in my discussions Catholics who even today are learning for the first time that there is some liturgy other than the Novus Ordo that Paul VI promulgated. And I can understand why: 50 years after the propagation of the Novus Ordo, the vast majority of the practicing Catholics have nothing else. On the other hand, the bishops themselves continually underestimate the number of Catholics who are attracted to tradition in all of its manifestations. They want to believe that it’s a tiny minority of Catholics who have a kind of aesthetic fascination or maybe a hankering for the unusual or the odd, as a kind of eccentricity, that’s how they tend to think about the attraction. What they’re missing is that people now are not thinking in the paradigms of the 1960s and 70s, which is where the bishops seem to be stuck. The liturgical reform was based on one primary principle, namely that the only way in which people have access to the liturgy or participate in the liturgy is through rational verbal comprehension; that’s the basic principle that drove everything. So, if you want people to understand everything that’s going on the Mass you have to simplify it, you have to abbreviate it, you have to make it in the vernacular, you have to do it out loud, everything has to be out loud. And all of this is in the service of communicating a rational conceptual content to the people in the pews; that’s the whole principle behind the reform. Young people today, if they believe at all, or if they’re searching for God, are not looking for rational conceptual content initially. Maybe they’ll study theology later, but what they’re looking for is a sense that there is something more to life and the world than what meets the eyes, what we see on the media, more than our everyday experience. They want to have their vision opened to something, I would even say something heavenly. Does Heaven really exist? The liturgy should be a proof that it does really exist, and if it isn’t, it’s just more talk. Then it’s just more of the same thing that you can get everywhere else. The world is just flooded with talk. So, the bishops are from a generation that assumed that liturgy is all about rational conceptual comprehension; that’s what participation means. They’re really missing the boat; this is not where things are happening anymore. In your life, have you ever witnessed people changing their minds about the Traditional Mass, i.e. hating it and loving it later on? And can you give testimony to the spiritual fruits or benefits people receive in the old Mass? What I have generally seen is that any Catholic who is serious about doctrine, about living a morally upright life, serious about a personal prayer life, committed to the rosary—Catholics like that are naturally drawn towards the traditional liturgy. As soon as they find out about it they’re open to it, because they’re living in a way that is in accord with the traditional liturgy. The traditional liturgy is deeply doctrinal, it enshrines the dogmas of the Church, it is ascetical, it’s demanding, so if you’re trying to live a morally upright life the traditional liturgy supports you in that and it makes demands on you that are moral demands. So I think that there’s a natural fit between serious Catholic life and the traditional liturgy. Obviously a serious Catholic life can exist in other ways, in other contexts, but I think that there’s that harmony and that openness. I don’t see hostility anymore to the traditional Mass except among people who identify themselves as liberals or progressives, who have an ax to grind—they’re ideologically opposed to it. But they’re opposed to it, interestingly, because it expresses a dogmatic and moral and cosmic world view that is antithetical to their whole liberal progressive paradigm, so they really see it as a threat to the entire Vatican II project. As far as spiritual fruits go, I’ve often said that I didn’t really know how to pray at Mass until I went to the old Mass. In my whole experience growing up as Catholic, I had assumed that liturgical prayer was just a kind of superficial back-and-forth between the priest and the people, and singing a bunch of songs, and very much on the surface like skating on the ice. And when I began attending the traditional liturgy it was like deep-sea diving, you have to put on the scuba equipment and go deep down into the ocean. There’s a depth, an endless depth that explains why for me and for many of my friends we never get tired of going to the traditional Mass, we always look forward to it. Wherever it is happening, we all we want to go to it. With the Novus Ordo you start to feel a lack of enthusiasm and it’s easier to skip it because there’s less there to benefit from. In what does sacramental sacrifice seem to you better expressed by the Traditional Mass? The Mass is the sacramental re-presentation of the sacrifice that Our Lord offered of His Body and Blood on the cross. That’s not just an opinion, that’s not just a scholastic point of view, that is the dogmatic de fide teaching of the Church at the Council of Trent. So the liturgy in that sense is not primarily a meal, it’s not primarily a commemoration of the resurrection, it’s not about the mystical body of Christ. It’s the sacrifice that makes possible the mystical Body of Christ. It’s the sacrifice that is obviously fulfilled, in a certain sense, in the resurrection and glorification of Christ; but really the Mass is putting us in contact with the saving redemptive blood of Christ. That is what we need in order to be saved, that is our salvation. And so it’s very important for the liturgy to communicate to us that this is the mystery. The primary mystery of the Eucharist, as Saint Thomas says, is Christus passus, the Christ who has suffered for our sins. That’s what the liturgy puts us mystically into contact with, really into contact with under the veil of bread and wine. There never were, in the history of Humanity, so many people far removed from the place they were born, either because they live in another country or simply because they are travelling. Wouldn’t the Latin Mass serve a pastoral purpose if all people can to attend “their” Mass even though they are attending Mass in another country? Do you think the Latin Mass served the real purpose of “globalism” in former times? There’s no question whatsoever that, if you look at European civilization - and I’m talking now about Western Europe, not so much Eastern Europe which has its own history - the presence of the Roman Catholic faith, the Roman Rite and various other uses related to the Roman Rite, and the Latin language were major unifying forces that kept people in communication with each other. This fertilized the arts and the intellectual life across all these different borders of language and region. It seems to me a supreme irony that in the 20th century, right when air travel was making it possible for people to travel more easily than ever, and automobiles being ubiquitous, right at that moment when people were travelling so much, suddenly, we decided to vernacularize liturgy and effectively cut off anybody who isn’t from the local community. In my younger days I traveled quite a bit, before I discovered the traditional Latin Mass. I would go to church, to the Novus Ordo in whatever language it was in, and I could hardly understand anything, I could understand Amen but that was about it. And it’s true – as I was saying before – that it’s not reducible to rational comprehension, but it’s very frustrating to go to a liturgy that is meant to be about the words, as the Novus Ordo is, and then not to understand any of them! Ironically, if there ever were liturgy that should be in Latin, it would have to be the Novus Ordo, because otherwise we’re going to end up excluding a lot of people. But the other point I would make is that it’s also ironic that just at a moment in world history where more people are literate than ever before, and where everyone can easily have access to what the prayers are saying if they wish to know, at that moment it was decided: “Oh no, we need to put things into an everyday vernacular language instead of using this high lofty poetic theologically rich language that liturgies always use. Now we have to simplify everything.” Why? People can read. So it seems to me just another example of historical misjudgment and cultural confusion on the part of the liturgical reformers. The traditional Liturgy is often criticized for not integrating the new saints canonized since Vatican II. But did not the new missal greatly devalue the Sanctoral? And do how do you think the new saints could be integrated? This is a complicated set of questions, but just in terms of the liturgy itself, the old Roman Rite – and again I would say the same is true about all of the Western rites and liturgies like the Ambrosian Rite or the rite of Braga – is heavily focused on the saints; the Saints are the backbone of the the calendar. Obviously you have the Sunday cycle which is very ancient, going back to the fourth century, you have Christmas and Easter and Pentecost, and the rhythm that’s created by these great feasts. But all of the rest of the time, the calendar is populated by the saints, the family of God. And to the faithful who attended the liturgy, the saints were like their familiar friends, or their older brothers and sisters. The liturgy is focused on the cult of the saints not only because the the old liturgy frequently makes reference to the Saints – for example, the Roman canon mentions 44 Saints, 41 of the New Testament and 3 of the Old Testament – but also because the day’s Mass is is structured based on what saint is being celebrated, so all of the propers of the Mass and the readings and the prayers, the orations, they have a unity because they’re determined by the saint. So in this sense the old liturgy is permeated with the cult of the saints. The new liturgy’s calendar severely reduces the number of saints who have to be commemorated, and when you do have a saint’s feast, only part of the liturgy is making reference to the saints, which leads to often strange results of having readings with no connection whatsoever to the saints being commemorated. I remember going one year to Mass on the feast of Saint Therese of Lisieux and hearing a reading about: “Woe to you, Chorazin!” There is such a disconnect between the reading and the saint. As for new saints, I do agree with Pope Benedict XVI that there should be a way eventually to be able to honor some of the newer saints, especially that newer saints who were devoted to the traditional Mass like Padre Pio. But the International Federation Una Voce has written a very fine position paper on this question, recommending ways to do this without significantly altering the old calendar that Catholics attached to the usus antiquior love. In some cases we already have the practice of commemorations in the traditional Latin Mass. It could be possible, for instance, to take some of the more obscure and Italian saints who were added very late to the old calendar, in the 19th century or the early 20th century, and to give them a lower status and to give some of the more recent saints a higher status. So there are definitely ways forward on that question; but the old calendar has to remain integral and respected because it’s such a fundamental part of the liturgy. Usually, people get to know first the Traditional Mass and then the Gregorian chant, but with you, the contrary happened. Do you think sacred music plays a role in liturgical renewal? Absolutely! You’re right to say that I came to liturgical tradition through sacred music and particularly through Gregorian chant. I had never seen prayer in Latin prior to discovering Gregorian chant, I had never even thought about praying in Latin. So even becoming aware of Latin as a language happened, for me, through Gregorian chant. The beauty of the chant mesmerized me, seized my heart, inspired me. Initially I didn’t even understand it as a musical language, or the Latin text, but I knew that there was something here that was numinous, something that was divine, something very special and very different and it fascinated me. It’s like what Rudolf Otto talks about: the “mysterium tremendum et fascinans.” There’s something very powerful and otherworldly about the chant. So that was initially the hook that pulled in the fish. When I discovered the traditional liturgy, what I quickly saw was: the traditional liturgy grew up with the chant; the chant and the old Roman Rite are like body and soul, they have a very intimate relationship together. It wasn’t that first you had the liturgy and then later on somebody added on the chant like an extrinsic garment. Rather, the Roman liturgy and its chant grew up together hand in hand. Gregorian chant is the Roman liturgy sung. So I saw very quickly that the chant fits, it’s at home, in the traditional liturgy. There’s the space for it to breathe, and the timing, the rhythm of the liturgy is perfectly calculated, the chants are just long enough to cover the actions that need to be covered, and the texts of the chants are perfect for those moments. So there’s this tight fit between the music and the liturgy. You also see this with polyphony: the great polyphony was able to be composed because there was room for it in the liturgy. The offertory takes time and so the great composers could write motets for these periods. The Novus Ordo is so rationalistic and so verbal and so brief that Gregorian chant and polyphony only ever seem awkward in connection with it. It’s always experienced as a kind of interruption and as a delay. For example, if you’re at a Novus Ordo Mass and you have a reading in the vernacular by a lay lector facing the people, and then a schola sings a Gregorian chant in Latin – sings the Gradual – it’s very weird, it doesn’t fit in at all. But in the traditional liturgy there’s this beautiful flow and everything fits well. So I think that for modern people to reconnect with the beauty of sacred music is almost equivalent to reconnecting with the traditional liturgy precisely for these reasons. That doesn’t mean that we shouldn’t use chant and polyphony in every liturgy of any sort, it just means they have a natural home and a natural place in the traditional liturgy. As final remark, could you leave a message to young families worried about preserving themselves and their children of all the confusion in the present society, do you have any advices for them? Nothing is more important for young Catholic families than to find a good community of faithful traditionally-minded Catholics. And even to make whatever sacrifices it takes to bring their family to Mass at such a church with such a community, because everyone there is going to the liturgy for the right reason: they want to glorify God, they want to sanctify their souls, they want to introduce their children to the beauty and the richness of Catholic tradition—and for that reason they’re going to meet other like-minded people who will become their support network, their friends; the children will meet other children they can play with safely, who aren’t as likely to be looking at terrible videos and things of that sort. In the modern world we have to be very realistic and not assume that most places are safe places anymore. Most places are unsafe from a moral point of view. I would say also, from an intellectual point of view, error and depravity are the norm for modern Western society, so we need to go out of our way to find communities where the norm is beauty and prayer and reverence. That’s what we find in connection with the traditional liturgy.